Most online discussions on the subject agree that the French widescreen dvd (by Carlotta) is the superior in terms of picture to any other versions; it is not cropped on all four sides to make the “widescreen” version like others, but only on the top and bottom as envisioned originally by Sippy and Dwarka Divecha (his superb cameraman, one of the best in Indian cinema history) to make the 70mm version from 35mm film. Alas, the French did not care to provide English subtitles (you sons of silly persons! no, just kidding—je vous aime, mes amis francais!). So Tom—whose OCD exceeds even mine and happily benefits all of us—took the Carlotta dvd, converted it properly to NTSC from PAL, and put English subtitles on it, including the songs. He did much more as well in his usual expert manner; he goes into detail on what other enhancements he made in his descriptive pdf file here. I am thrilled with the results and you will be too, especially if you have a nice big widescreen television. there is a dramatic intimacy to the cropped 70mm version. It brings you right into the frame instead of distancing you as an observer. Believe me, it is breathtaking. Sometimes less really is more! Unfortunately the Carlotta dvd has the “censored” ending and there wasn’t much Tom could do about that (I much prefer the original) but…baby steps! Generally we fans of old Hindi cinema are better off with a regular old television on the smaller side and not a fabulous shiny widescreen one, but this version of Sholay sorely tempts me to take the plunge. When Tom told me that he had put in the huge effort to combine the best of several different versions into one single version and asked me to share it with you I wondered what on earth I could say about this film that hasn’t been said already. Love it or hate it, it has been discussed and analyzed to death. So I will just say this: I think it is one of the most entertaining, most moving, most repeat-watchable films ever made. I’m relatively new to Indian cinema, but I’ve probably seen Sholay more than twenty times. Though it is long, it is so compelling on so many levels that I never get tired of it. The finely drawn characters and relationships, the tragedy and romance, the sweeping panorama of the landscape, the lively village oppressed by the mesmerizing sick evil of Gabbar Singh…everything comes together to make a gripping movie which really deserves to have some effort put into restoring and releasing it with care (Martin Scorsese, are you listening?). This dvd from Tom comes closer than any other to a definitive version, and I am so grateful to have it. You can download it here. Apparently mediafire has done something to correct their habit of corrupting files, which means that it’s easier to download and put the files together into a dvd. Tom has updated the included instructions accordingly—please read them; they are very helpful! Enjoy—and once again: bahut bahut shukriya, Tom! Posted on November 7, 2010 at 11:00 am in Hindi movies	| RSS feed You can skip to the end and leave a reply. i saw sholay as a five year old and still haven’t managed towatch it again! so have to get this dvd. the pics look great and thanks greta for the recom! Well I have two other versions, and except for the ending you won’t find a better one than this :) It’s a wonderful film, and Tom has done it justice! Thanks, Greta, for writing this up in this manner. Am sure if you’d written up the story, you’d have found a way to throw in something new inspite of plenty of reviews already existing on this film. Having said that, this write-up is better if only because it truly does justice to the real hero of this post. Jai and Veeru may have been the two heroes in Sippy’s 1975 Sholay but 2010’s “wide-screen”, hugely-improved, song-subtitled Sholay has one and one hero only – and that is Tom. I have just read what he has written in the pdf document. Wow!!! Just wow!!! Am not sure I understood everything (to be honest, I am pretty sure I haven’t) but he deserves some sort of award for what he has done on this. I have known Tom for a while now and worked on a few subtitling projects with him. What has always struck me about him is his absolutely uncompromising approach to quality. It has often meant that he has had to put in many more hours than he would have needed to, with an “easy way out” approach. But then that wouldn’t be our Tom, would it? On this Sholay project, he exceeds even his own amazing standards. And the result is there for all to see. I got to see this during the subtitling review that I was part of. Have not seen this version on TV but I am pretty sure I will. I LOVE this movie (like millions of others, including you and Tom) and this version will, I am sure, make it a totally different experience. I want to also say that Tom has been extremely kind to me by mentioning my “subtitling help” in his pdf document. Well, I did review the subtitles line-by-line but they were already so good that there was very little that needed to be changed, IMO. Tom had already done the real hard work (as he has described in his document). So this post is very rightly a dedication to Tom more than anything else. You’ve hit just the right chord here, memsaab. God bless you, Greta & Tom! You guys are marvelous… this is the best new year gift I’ve received this year. The Gujarati new year just started and I am so happy to find this post as the first one I’m reading. Thanks so much for sharing all the Sholay love. I can’t wait to watch this DVD. That’s how I felt when Tom told me about this…it’s just a gift. His efforts are beyond my abilities to even comprehend, all I know is that it looks wonderful and I hope he inspires someone somewhere to pitch in and start doing similar work on these films too. Totally great! Thanks to all the people involved in this. I liked Sholay but only watched it once…. I’m not sure about the loss of info, but it’s tru that “widescreen” gives a more… “cinematic” quality to it. I had never seen a widescreen version before, and this felt really much more dramatic even than usual, feels much more like one is in the frame with the action and the actors to me…hope you like it too! I think that probably whatever was left out of the actual 70 mm version was not much different from what is cropped out here. I just want to reiterate what everyone has said so far – amazing! Words cannot express my gratitude and appreciation for all the hard work that all of you do on all of these projects. Thanks to Tom, Greta and Raja for all their work and their generosity in sharing that work with all of us. I’ll second (or whatever) that. Thank you, Tom. Thank you ever so much! And Raja, and Greta. You’re back :-) And how! This is truly phenomenal. Can’t wait to watch it. Many, many thanks to Tom. Watched the ‘Follow the Star’ series. Quite moving. Apart from everything else, Manmohan Desai is just hilarious. Memsaabstory rocks! I am just the communication vehicle; all the thanks should go to Tom and Raja for this one, especially Tom. I know he spent a LOT OF TIME on this, and it deserves the effort he put in. Even if you don’t need subs (you can turn them off) I think THIS is the version that everyone should have of this amazing film. Aww… if only I knew. Would have loved to meet you and hang out. Next time pls do let me know. I didn’t know you were there either :) Now I do! Amazing work! Thank you Tom for this incredible effort! And thanks Greta! My first brush with Sholay was because of the the audio cassette version of the film. So as a kid even though I hadn’t seen the film, I managed to memorize the dialogues from the entire film. I think it was one of the first Indian films to have an audio release and that too must have helped Sholay achieve the cult status that it enjoys now. Amitabh videos are just gorgeous. Am I allowed to link the video clips elsehere Tom? The Amitabh Bachchan videos? Sure, link away. Bonsoir Madame. Grateful for your reply to my previous letter. I’ll check up the website mentioned. I am really desperate to grab that VCD/DVD. By the way, this review of yours completely fooled me. Actually I was surprised initially when I saw that this is the new film you have chosen to comment on, when you have referred to it a million times in your other reviews. So I opened it and …WHOOPS! A GOOGLY! Nice pictures and quite an useful bit of information. I’ll pass it on to my younger sister who has been caught by the 70s BOLLY bug and she may soon buy one DVD. I will collect her feedback for you. Thank you all for your thanks—let’s keep him going! Yes, Tom is indeed a hero. I think Indian dvd companies should hire him as a consultant. Thank you Memsaab, for opening doors to our viewing pleasure. Just one thing–if you look at the train shot again (above) doesn’t the guy behind Dharmendra look scarily like a blacked up Hritihik? Is there anyone you don’t know the name of? You’re amazing and I love your passion for finding out people’s names and an ability to recognize them. THANK YOU! There is no way I could ever remember something like that, I don’t even remember what I had for dinner last night. Alas, my reincarnation theory fizzles. I wouldn’t be surprised if there was some weird genealogical connection between Hrithik and Mushtaq. Wouldn’t surprise me either, they all seem to be related to each other somehow! This sounds amazing. Tom has really excelled himself by the sound of it. So much effort and devotion almost makes me want to watch this Sholay again, to see if it underwhelms me as much as it did the first time I watched it. Unfortunately, since the ‘killer shoe’ was the highlight of this ‘meh’sterpiece for me, knowing it’s not in Tom’s labour of love is a real shame. Since you know almost everything about Hindi films maybe so you are probably aware of this bit of trivia;when the film was released I remember reading that initially Gabbar Singh’s role was offered to Danny Denzongpa, however Danny was doing Feroz Khan’s Dharmatma and had no dates to spare. Ramesh Sippy signed the relatively unknown Amjad Khan – he had done a few films but was yet to see success. Sholay went on to become a super hit film and Amjad Khan became a legend of sorts while Dharmatma was not that successful and Danny gained nothing from that film. Very true, Shilpi. Also, the role of Jai was to have gone to Shatrughan Sinha originally. Javed (of Salim-Javed duo) got wind of it and they informed Amitabh of it. Amitabh then approached Dharmendra who then spoke to Ramesh Sippy and got him on board. I simply don’t know why Ramesh Sippy never cast Amjad in any of his forthcoming movies again. Possibly, because he felt it would have been a grave injustice to Amjad’s talent. Somehow I have this eerie feeling that Hema Malini chose to get her character killed in Dharmatma just so that she could allocate dates to Sholay. After all, if Danny had date problems even Hema could have the same. But, but, but… all this is my own guesswork and I haven’t read this anywhere. @Shashi – Interesting thought there! We shall never know what happened. On the other hand, Hema was sort of a lucky mascot for Ramesh Sippy with Andaz and Seeta Aur Geeta having hit the jackpot and must have already committed her dates for Sholay as well. Another ‘track’ to this story is that with Dharmatma which is loosely based on Godfather, Hema’s character was suposed to die anyway and she must have known about this. To further twist this up, most of Danny’s work in Dharmatma is related to the scenes where Hema appears, so both of them should have been free around the same time. Could it be that Hema with her star power was able to dictate terms to filmmakers? Very true – Ramesh Sippy was already a big name with two big hits behind him – ‘Andaz’ (1971) and ‘Seeta Aur Geeta’ (1972). I prefer the 35mm to the 70mm – it makes the sets, props and actions feel more real, rather than fake pretend because, as you said, there’s more information on the screen. Though I had read this post as soon as it was posted, I had decided not to comment on this post till I personally downloaded this movie. After getting my main internet connection to work (it was out of order for one week), I finally managed to download the entire files and managed to create the ISO file. I watched the movie on the computer itself, and I am guess watching this movie on a TV will be a memorable experience. I too had a Sholay DVD but that DVD hardly worked. Now this will be my source for watching Sholay. I indeed watched the entire movie on my computer today. It is a great work done by Tom. I thank him from the core of my heart. And I also thank the other like minded people who are doing a great job on their own initiative that should have been done by the Hindi movie industry people in the first place. It is great watching this print of this movie. I am in fact getting tempted to to watch it again, and I am one person who cannot find time to watch movies ! Do watch it on a widescreen television if you can, it is spectacular :) And thank you for coming back to let us know that it worked fine and was worth the trouble!!!! I don’t know what is wrong with the Sippys (or others involved in making it) that they haven’t done something fantastic with this. Oops, I have a widescreen TV which I barely watch (and then I use it only to watch TV programmes). Let me find out how to use it to watch this movie. I am very impressed with all that i have read in this website in regards to Sholay. It sure brought back many memories. I am dying to see the songs subtitled in English. Can someone please direct me as to how i can watch Tom’s version on my PC? By the way why was Jagdeep’s and Asrani’s role cut so short in this great movie? Sholay is still the best. You’ll need to download it, then it should be easy to watch on your PC or television if you are so inclined. I am unsure how to find the link to Tom’s improved version. (I suppose i am technically useless). I will however do anything to get this . Where do i begin? I was so furious with both EROS & DEI who made the 2 Sholay versions into DVD and yet left out the subtitles for the song. Could you please remove my e-mail address from public domain (my 1st e-mail) as promised please? This is a remarkable observation on the way in which so many Hindi films are butchered – we need far greater quality control but I’m not sure if the 70mm does justice to what was filmed? Is this going against the wishes of the director? Nevertheless, with pan and scan in the eighties so many films shot in scope have yet to be translated adequately onto DVD. An excellent blog by the way. I have three versions of the film and this one is the most powerful by far visually…since the director doesn’t see fit to share his vision with us on dvd then we have no way to know if this goes against his wishes or not (and frankly, unless and until he steps up I don’t really care). I have seen Sholay more than 10 times, and although it is always engaging, but it has never looked as beautiful as it is looking in the screen caps. The AB documentary is fantastic. Kudos to Tom for putting in so much effort, and to Greta for sharing it. Completely agree on doing something special for such classics, there are so many that deserve better viewing experience. Screen caps don’t even come close—download it and watch it on a good television :) Kudos to Tom indeed, am glad he is doing what he can for these films. This is fantastic! Haven’t got to the ending though (I can’t imagine letting Gabbar Singh live!) but what I’ve seen is already revelatory. One of htose cases of not realizing what you’re missing with pan and scan, although I couldn’t put my finger on why some scenes didn’t seem to work all that well (like Mehbooba Mehbooba, when you can see everyone in the shot, it makes so much more sense.) Many thanks to Tom! Wow, thanks for very interesting details and links to you and Tom! I should probably read all the comments before asking this but I’m in a hurry and really want to know…what censored ending? See, the sholay dvdrip that I have- which btw has the best resolution, contrast and screen width you could want- shows a sad and lonely Veeru leaving Rampur- getting on the train and finding Basanti waiting inside. That’s what happens right? RIGHT? Please don’t tell me there’s an alternative version where Jai lives after all and Veeru doesn’t get the girl! Trojan, the alternate ending deals with the question how Gabbar Singh is dealt with. In the alternate version he is not taken by police. Read Anupama Chopras Sholay book for details. wow. thanks. I’ll definitely read it. Sholay fascinates me with it’s classiness in the middle of a decade of campy glory. does Tom’s movie have this ending? As memsaab mentioned near the beginning of her review, this is the censored version where the long arm of the law stops Thakur from stomping Gabbar Singh to death. Veeru still gets Basanti at the end. In addition, the PDF file to which memsaab links itself has links to articles detailing the problems the Sippys had with the censor board and what changes were forced upon them. Since ‘DVDRip’ usually means an XviD AVI, I’d tend to be somewhat skeptical of that statement unless I could confirm it for myself. One reason is that almost all the AVIs of the film with which I’m familiar have been made from the atrocious Eros DVDs. The other is that, almost by definition, AVIs are inferior to their DVD sources. You’re absolutely right. My version is an avi, but it’s still awesome. I’m trying to find the torrent from where I downloaded the movie and if I do, I’ll post it here. So, you can verify my claim for yourself. But then again, you gotta understand. Sholay was always a weekend pleasure, regularly shown during the Sunday Matinee TV hours on zee cinema. The quality was as atrocious as it was usual for the films shown on TV. All old movies had that grainy, dark, crap-contrasted look. So, to find THIS version and watch it on my LCD monitor…let’s just say, I was completely blown away. Suddenly, I could appreciate a lot more about the story than I had ever before. I had taken it for granted I think- just another masala flick from the 70s. I revere its makers now even more than the actors who fleshed out their script and ideas. You are probably referring to Farooq’s version (BTW, I don’t post torrent links here so will delete it if you do put it up :). I think you should try Tom’s version and see what you think! Ouch, harsh. But ok, will do. Totally unrelated to all blog-comments, last night I had a dream that I have this privilege of watching outtakes and extended scenes of SHOLAY’s films and we all gathered applaud the wonderful job the editor did in making all scenes so rich by cutting so well. SHOLAY has to be seen in as rich a format available as possible. However, SHOLAY is not a film, it is a phenomenon. It has to be viewed with ignorance of the medium and simply has to be absorbed thru the milieu. It exceeds the SEVEN SAMURAI, MAGNIFICIANT SEVEN, BUTCH CASSIDY…, ONCE UPON A TIME…., etc and kudos to Salim-Javed in making it possible. The version of Gabbar being killed by Thakur is the poetic justice and it is the best and should be commended. The richness of the film eg the train scene in the beginning which took like 30 days to shoot is to be revered and nuances of Amitabh and Hema Malini are just too good to be lost in any mediocre DVD format, so Tom’s version makes total sense. All I am trying to say is that Callie should be named Jeeru (Jai + Veeru) or Basanti as appropriate. Or Gabbur (Gabbar + Thakur) as it used to be pet of Gabbar and Thakur when they were room mates after their demise in heaven colony number 7. 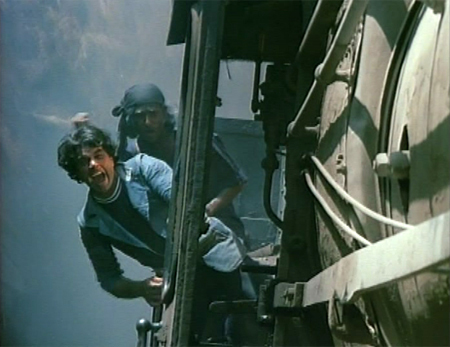 I first saw Sholay in Minerva (`Pride of Maharashtra’) and remember feeling very scared. Decades later, we saw a DVD in the public library and decided to watch it and were startled to see this was the director’s cut. Gabbar is impaled after the Thakur’s `boots’ have walked all over him. Other scenes, which I don’t remember in earlier viewings of this movie included Gabbar torturing Sachin to death and the Thakur’s loyal servant, played by Satyen Kappu, hammering nails into the mojdis before the Thakur sets out to get Gabbar. Yema Malini yactually yammered yexcellent in this movie, Lal Patthar being another one. An old test-your-Sholay-knowledge joke went like this – When Jai is being cremated, remember Radha being embraced by Thakur? If you said, yes, then the jokester promptly pounced on you – but how can the Thakur embrace her, he has no hands! Did you sleep through the movie or what! The radio programme aired on Sunday afternoons, voice of Amin Sayani and I don’t remember the name of the lady compere, but her line was: Khamosh aag mein jalti hui widhwa Radha, Jaya Bhaduri. Memsaab……It is a very sad case in India wherein once the movie has been released and becomes a hit, the original producer or director show no interest whatsoever in that film. I only wish the Sippys’ had to take upon themselves to restore their timeless classic with new print and sound technology and present it on Blu-Ray….alas such things don’t happen in India. Lawry, yes, many DVDs show appalling image and sound quality. I have some new Hindi movies on bluray and watch them extra-large about 2 meters wide with a Full HD beamer. I must say that the average film doesn’t look so much better on bluray (ca. 1920×1080 pixels resolution) than another film from regular DVD (ca. 768×520 pixels), but usually i had only the bluray version and not the DVD versoin to compare. Maybe without knowing the format currently playing, i couldn’t even tell bluray from DVD (maybe my bluray player is very talented at upscaling the low-res DVD material). Only the bluray menues and the *paused* bluray movie look strikingly better than a DVD. With Chak de India i noted that the sound from Bluray seemed much better than from a TV screening that friends had recorded to DVD, the rock music via bluray had a lot of punch. There is one situation where the bluray beamer really shows its muscles and displays glistening image quality: When i connect camera or laptop and gawk at my own still photos and even zoom into them. Agree with you Henrik…………..not sure if full justice is done to those transfers, the producers are more for maximizing the profits. As for the Sippys, they are a joke! Would anyone agree with me that had sholay been produced/directed by the late Raj Kapoor or even Yash Chopra we would perhaps be spared this endless debate. The Sippys are a joke and lacked vision. RK films are not only preserverd for the quality of their movies but they were also visionaries. See the dvd qualities of ”Mera naam Joker” (1970) — ”Bobby” 1973 or ”Satyam Shivam Sundaram” 1978. One would see that even before the advent of DVD the quality of these movies on rental VHS videos were far superior to most indian movies. This proves that RK movies preserved and improved all aspects. The Sippys clothe themselves on past glory. They had no vision for the future. I am still shocked that to date the movie songs of Sholay has no English subtitles. Is this the same movie that India Times have rated as the best from india? I have watched the Sippy interviews on You TUBE and i see nothing from that interview than share arrogance. Bollywood movies have become a world wide phenomenon and technology DVD, BLU RAY OR 3D now allows full subtitle for both dialogue and songs. The fact that the Sippys have ignored this part of the business shows that their action was blatant, egregious and outrageous. Memsaab what do you think? I know nothing about the Sippys and can only comment on the subtitling of the songs. As far as I know, that’s solely up to the DVD production company and, as we all know, Eros Entertainment is one of the worst for not subtitling the songs. My French DVD version of the film had the songs subbed (but in French only, unfortunately), and for the DVD being reviewed here I got the translations elsewhere and then Raja edited and improved on some of them. If you want good English subtitles for this film, including for all the songs, and want it in 16:9 for your nice widescreen Hi-Def TV set, you might be interested in downloading this DVD. Excellent research Paul ! Love your comments “The Sippys clothe themselves on past glory. They had no vision for the future” Where art thou Ramesh ???? Downloaded your version of Sholay. Excellent job! I saw Sholay at Minerva eight times during 1975-77 when I was at TIFR Bombay. Whenever relatives came from Punjab to visit me they insisted on seeing Sholay at Minerva so they cpould brag when they returned to Punjab. Also saw lots of old movies specially in the red-light-district theaters, Taj, Alexandra etc. Saw Albela once when it was in Lal Baug at Jai Hind, I believe. There was mad dancing in the aisles. It became so popular that they moved it to Maratha Mandir where I saw it twice more! i have nothing but respect and admiration for all individuals who have taken the laudable effort to restructure and add English Subtitles to the movie Sholay Songs. This is a unique movie from India that needs to be well preserved, cherished and refreshed for all generations even those yet unborn. I will also agree that DVD production Companies who bought the rights to reproduce these movies on DVD should bear the responsibility to Subtitle both dialogues and songs of the DVD movies. My contention with the Sippy’s -is that they claimed that SHOLAY was an ”accidental overnight success”. They did not expect Sholay to do well and hence no dramatic advertising, Marketing; publicity was seriously generated in India at the time (1975). However i understand that there was the ”people power” as film goers at the time started’ ’mouth to mouth” spreading good news about the movie in almost every town in India. Those who had seen the movie started telling friends and families. Hence there was an explosion of interest in the movie and it became an overnight success. Producers/Directors are supposed to be Visionaries–Yash Chopra, Subhash Ghai, or the Late Raj Kapoor would have not only enjoyed the success but also preserve and plan for the future. re print and planned for a new era of home video cinemas.. Check out all Raj Kapoor DVDs they all have songs subtitles NOT because of the DVD production Companies but because it was planned by the great Legend (Kapoor) himself. He had a vision. See all Yash Chopras movies. He envisaged the Market needs. He knew Bollywood will eventually go international and yes he’s always had English subtitle for all his movies long before DVD came along. Check—Waqt (1965), Ittefaq (1969) Daag (1973) or Deewar (1975). So while i 100% agree with Tom that DVD production Companies should be responsible for Bollywood dvd subtitles in the Market; yet Producers /Director like Ramesh Sippy could have shown a better vision just like his contemporaries. Who in his right mind will take Sholay to an international Film Festival in say Dubai, Abu diabi, Milan or Cannes (France) and show Sholay without English Subtitle? Even the Great Big B or Dharam will stage a walk out. Best film. Big B, Dharamendra, hema, jaya, sanjeev, and amjad have done their best!! after this film everyone became famous…. I’ve done the same with the great gambler. Seen it 100 times. Sholay was great no doubt about but I always felt that the role of Gabbar Singh would have suited Shatrughan Sinha the best. I read somewhere that originally it was written for him but he wanted to play Amitabh’s character. Danny had refused this one for Parveen as they were shooting for Chandi Sona in Mauritius. Just imagine Teraaaaaaaa kya hoga kaliya in Shatru’s voice. Watched Sholay for the first time yesterday. What a movie! it absolutely lives up to all the hype, although it did seem to drag at times and could therefore have been shortened. That is my only complaint. Otherwise it is definetly worth watching on the big screen. Amjad Khan has got to be the most impressive debutant of all time. He managed to stand out, amidst the presence of all the big named stars. Sholay is an indian western with a big star cast. Amit & Dharam are good but they are simply blown away by Amjad Khan – What a performance on debut. Hema is lovable while sanjeev & jaya get our sympathys. Pity, amjad could not capitalise & go on to give good performances. With its success, Amitabh realized that if he had to last longer, he had to go in for multi starrers which he did. It must be said that Amjad Khan was a tragically underused actor. His performance in Shatranj Ke Khiladi (1977) as the hedonistic, artistically inclined ruler was outstanding, particularly in the scene in which he is dethroned- one of the finest scenes of Hindi cinema I’ve ever seen. I still remember the day movie was released. I was studing in Chandigarh. It was Friday August 15, 1975 the day movie was released at Jagat Cinema. Along with a few friends I went to see 6 P.M. show. We could not get a ticket for this show and next show as well and end up going to Neelam Theatre just opposite to Jagat Theatre and watched ” Raakhi Aur Hathkadi” starring Vijay Arora and Asha Parekh. Next day some how we got tickets and entered the theatre late when Bandits were trying to loot the train. After fifteen weeks of sucessful run the film Sholay was introduced with new film print with stereophonic sound which was quite new at that time. I again went to see the movie to experience it galore and theatre was again ran housefull for many weeks. sholay was re released in 3D recently. don’t know how’s quality though. earlier it was re-released with Dolby surround or Dolby Digital or DTS (can’t remember) sound in the year 2004. lookin 4 the 3D version, in blu ray format. Very nice work by Tom. Thank you.